Ayahuasca is an Amazonian plant mixture that is capable of inducing altered states of consciousness, usually lasting between 4 to 8 hours after ingestion. Ranging from mildly stimulating to extremely visionary, ayahuasca is used primarily as a medicine and as a shamanic means of communication, typically in a ceremonial session under the guidance of an experienced drinker. One can’t help but wonder—could the rise in people suffering from anxiety-related mental disorders be helped by the increased popularity of ayahuasca? While the industrialized world has delivered ever-increasing comfort, safety, and useful technology, it has also left a shadowy legacy of stress, isolation, and disconnection from nature and community. With more people than ever seeking treatment for moderate to debilitating anxiety, it is no wonder that ayahuasca, a traditional plant medicine renowned for psychospiritual healing, is become more and more popular in the Western world, causing leading scientists and mental health experts to begin taking serious notice. But can science fully understand this ancient psychedelic plant medicine and healing tradition? 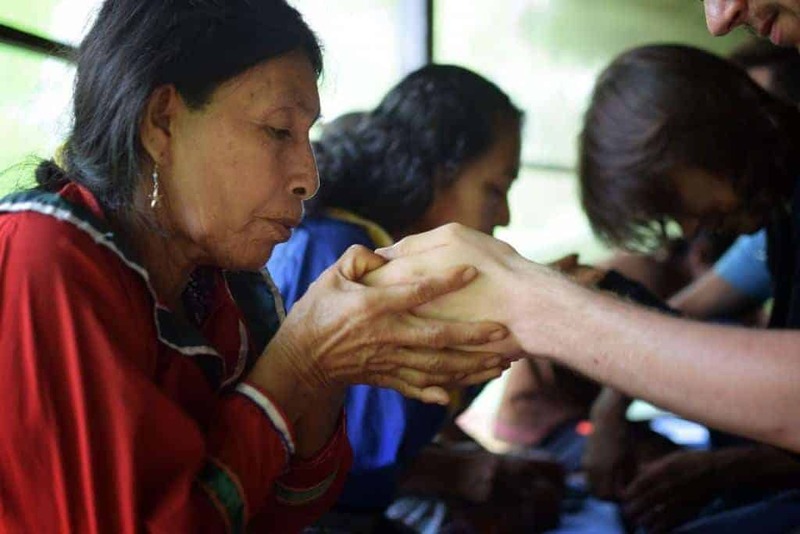 To gain insight into these questions, we spoke with Matthew Watherston, founder of the Temple of the Way of Light which provides traditional ayahuasca healing ceremonies in Peru. As a westerner who has been working with traditional Shipibo healers and hosting cutting edge research by the international organization ICEERS, he is uniquely poised to offer an inside perspective on where scientific understanding and ancient tradition meet and how each of these paradigms approaches mental health and postmodern malaise. Thank you again for speaking with us, Matthew. More and more studies are talking about the benefits of ayahuasca and other psychedelics. You’ve been running the Temple of the Way of Light for about 10 years now; how do you see this new flood of scientific research and interest in entheogens? Has it affected the kinds of people who come to the Temple for healing? I think that research to measure the efficacy of ayahuasca healing is very necessary, although with an understanding that the Western scientific lens can never fully understand the magic and mystery of ayahuasca or how plant spirit healing functions at an energetic and spiritual level. However, having facilitated deep healing for thousands of people at the Temple over the past nine years, it has been in some ways frustrating that the evidence of the profound results that we regularly witness remains purely anecdotal. Before I share more thoughts on the potential of scientific studies about ayahuasca, I would like to be clear that, from my perspective, ayahuasca is much more than simply a psycho-pharmaceutical with physical properties that after ingestion result in psychological and physiological reactions. It is a sentient, intelligent plant spirit, doctor, and teacher that operates primarily on energetic, psychic, and spiritual levels. I also suspect that the medicine works on sub-molecular levels that western science does not yet have the tools to measure. I would also like to highlight that, from my point of view, it is important for us to respect the traditions and ancient healing technologies that are held by the indigenous record-keepers of the medicine. They are the real masters of the medicine, and there is much we can learn from them. We need to honor indigenous traditions and not dismiss their ways of working with ayahuasca as hocus-pocus and magical nonsense, as is often seen within Western academic, scientific, and medical communities. Underpinning the Temple’s work is our vision for the incredible mastery of indigenous healers to be respected, legitimized, and honored in the modern world. We aim to cultivate a richer understanding in the West of the Shipibo system of shamanic healthcare and substantiate the efficacy of their ethno-medical traditions. Indigenous healers have a system of sacred science that has evolved over thousands of years, coming from a profound relationship with and understanding of medicinal plants. Western science, on the other hand, is only really beginning to initiate its journey of discovery, one that comes from a completely different perspective. Imagine a time traveler with a laptop who jumps back to 33,000 BC and demonstrates 21st-century games, movies, and music to the people living at that time. The time traveler and the laptop would almost certainly be viewed with much fear and consternation. People certainly would have no idea how pictures and sound were being shown to them on the screen. They would not understand the inner workings of the laptop and would likely run away as fast as they could. When Western science attempts to understand ayahuasca healing, it can be argued that scientists are similarly unable to comprehend the energetic and spiritual aspects of the medicine, as these lie outside of their current paradigm. The issue is that Western science often operates with a level of blindness that blocks its ability to see beyond its limited perspectives, technologies, and systems of measurement. Do you think that ayahuasca can ever be fully deconstructed and understood scientifically? The measureless complexities and intricacies of genuine ayahuasca healing can never be fully analyzed or understood by Western science. My hope is that, as this flood of research to investigate ayahuasca healing continues, researchers will be able to put aside Cartesian doubts and humbly open to the possibility that ayahuasca is primarily functioning on spiritual and energetic levels that cannot be measured by Western science. Ethnobotanicals such as ayahuasca have considerable potential for treating a wide range of conditions, from depression to stress disorders to substance abuse. Clinical research is also starting to shed light on the complex neuropsychological effects of these plants and the implications for improved cognitive function and integrative thinking that can help people deal with daily life issues in more effective and creative ways. Science is a powerful tool to break through the moralistic propaganda that stigmatizes certain practices as ‘irresponsible drug use’ that have been an integral part of the well-being and survival of indigenous communities of the Amazon basin for centuries. Science serves balanced educational outreach about potential risks and benefits of traditional healing practices and helps shed light on how we can further reduce those risks and maximize those benefits. Recent scientific breakthroughs have broadened our understanding of medicinal plants, such as ayahuasca, and their psychological and neurological effects on the human psyche. This research has complemented the vast ethnobotanical knowledge of the indigenous communities that have been working with these plants since antiquity and has provided validation for the practices these communities have developed around these plant species. Shamanic healing is part of the cultural heritage of every nation of our planet, although it has been largely lost in modern society due to the ruthless suppression by organized religion in the Middle Ages. The religious reasons for the persecution of traditional healers are groundless when one appreciates that shamanism is a method, not a religion, and thus does not conflict with any religious tradition. The widespread eradication of traditional healing practices in Europe, leading into the emergence of the Renaissance and the birth of modern medicine, has left 21st-century healthcare bereft of any real understanding that, at our core, we are formed of energy. In order to fully understand the health of our species and to have a healthcare system that can adequately promote our well-being, we need to recognize the full composition of our being, which extends beyond the physical into the non-physical. Can you share some insights on how this ancient “technology” of energetic healing works according to the traditional perspective? Ayahuasca and traditional medicine works on all levels of our system, starting energetically and spiritually and leading into emotional, psychological, and physical levels. Amazonian indigenous traditions understand that plants, like humans, have a non-physical, spiritual aspect. They work with the spirits of the medicinal trees and plants of the Amazon, including ayahuasca. Ayahuasca gets a lot of attention in modern media, but it’s seldom mentioned that healers see ayahuasca simply as one medicine (composed of two plants) within a myriad of other plant spirits. Only by working with many plant and tree spirits in ceremony—not just ayahuasca—are they able to carry out deep and lasting healing. Research studies will, of course, not be able to measure this fact and will therefore never truly be able to understand how traditional ayahuasca healing really functions. By expanding their consciousness and operating from within a non-physical realm—the spirit world or what is often referred to as the astral dimension in the West—healers encounter and communicate with the spirits of the plants that act as doctors and teachers. It is these spirit doctors, including the spirit of ayahuasca, that are truly carrying the healing process. At the most basic level, Amazonian healers are conduits to these doctor spirits that are able to clear and cleanse negative energies, return power to people who have lost theirs due to difficult life experiences, and restore the fabric of one’s soul.